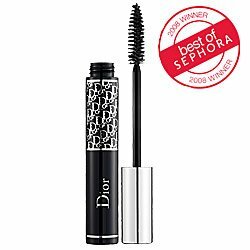 What it is:A cult-followed mascara that leaves lashes ultra thick, long, and curled.What it is formulated to do:Diorshow Mascara is Dior's original, must-have mascara that delivers ultra-glam, catwalk-length lashes. Makeup artists all over the world use this product to create the longest, thickest, curviest lashes ever. Aqua (Water), Glyceryl Stearate, C18-36 Acid Triglyceride, Cera Alba (Beeswax), Stearic Acid, Copernica Cerifera (Carnauba) Wax, Silica, Glyceryl Stearate, Isostearic Acid, Shellac, Myristic Acid, Triethanolamine, Glyceryl Hydrogenated Rosinate, PVP/VA Copolymer, Hydrolyzed Keratin, Lecithin, Xanthan Gum, Methylparaben, Parfum (Fragrance), Diazolidinyl Urea, Butylparaben, Ethylparaben, Tetrasodium EDTA, Isobutylparaben, Propylparaben, Geraniol, Citronellol, Cinnamyl Alcohol, Hydroxyisohexyl 3-Cyclohexene Carboxaldehyde. +/- May Contain: Mica, CI 77491, 77492, 77499 (Iron Oxides), CI 77007 (Ultramarines), CI 75470 (Carmine), CI 77891 (Titanium Dioxide), CI 77289 (Chromium Hydroxide Green), CI 77288 (Chromium Oxide Greens).